During the weekend we decided to have a little trip just out Melbourne. Our Little Mr. Copycat is a big train fan (will he ever get out of this phase? I hope soon!) so we thought we could spend up to 90 minutes on trains. He was very, VERY excited! When the train left the station he started shouting choo-choo and moving his arms in a train motion (if you know what I mean). I was not that excited and after only 10 minutes I wished I could move to another carriage (on my own!). When we arrived at our final destination I couldn’t wait to get off the train, breathe fresh air and explore. 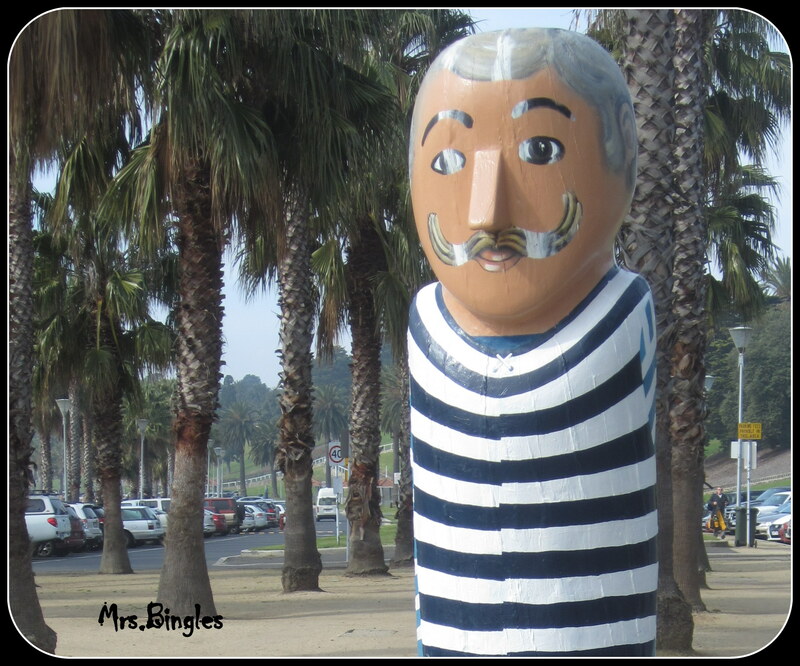 Geelong train station is a nice little station just a few minutes walk from the seaside. When we left home we were heading to the National Wool Museum but something along the way made us change our mind. First of all the kids were hungry, so we headed towards the beach to have a picnic. 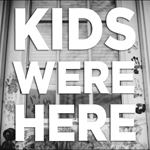 Here is where everything started. 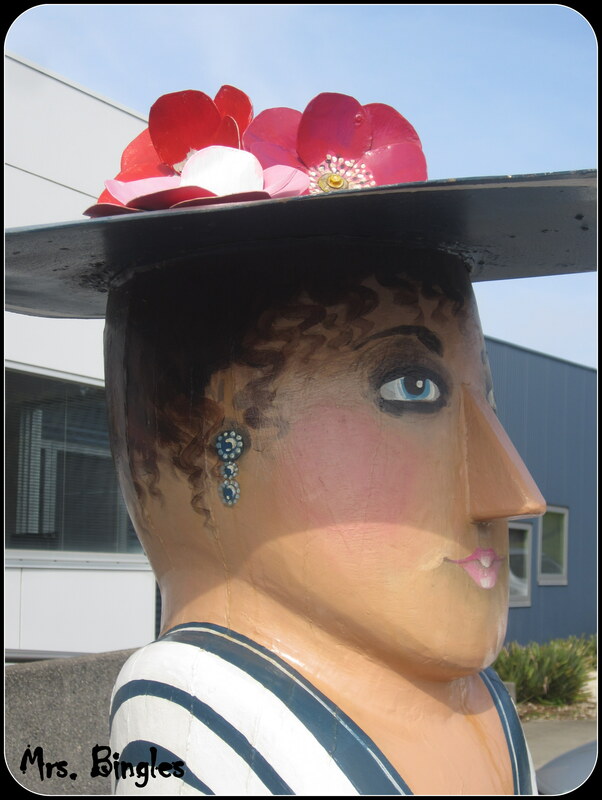 We found the first few bollards sculptures and we couldn’t help but following the waterfront to find more. 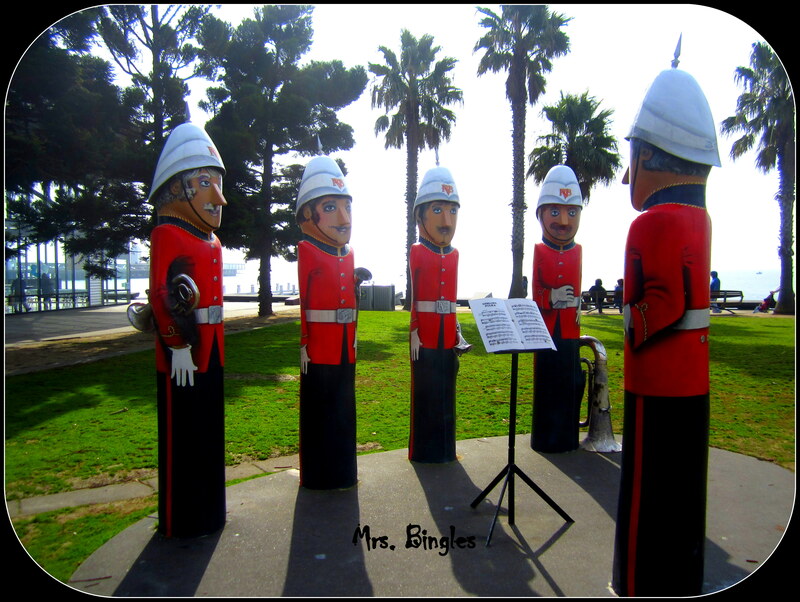 VOLUNTEER RIFLE BAND (5) Playing “The Geelong Polka”, this group represents players in Geelong’s first band concerts which were held in the Botanic Gardens in 1861. 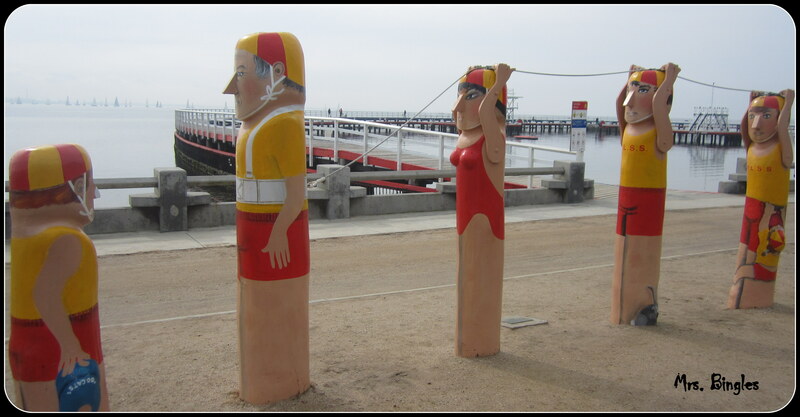 Later I found out that in 1995 the City of Geelong commissioned the Australian artist Jan Mitchell to transform reclaimed timber pier pylons into these unique works of art. 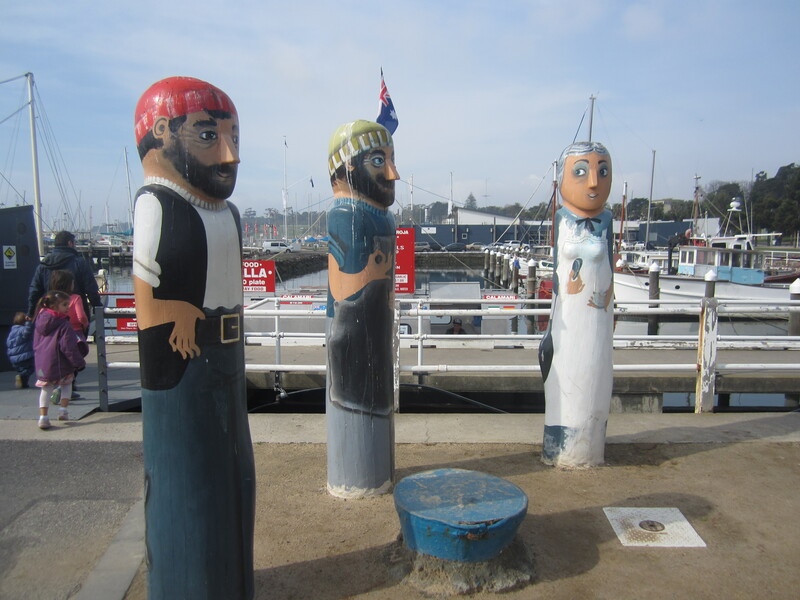 We followed the waterfront and met many characters who played a part in Geelong’s history, from the original Indigenous inhabitants to more contemporary characters (source: http://www.onlygeelong.com.au/46369/geelong-bollards-trail). TRAM CONDUCTRESS This is a 1940’s tram conductress. Trams in Geelong ran from 1912 to 1956. SCALLOP FISHERMEN AND WOMAN (3) From the early 1800’s, fish and crustaceans from Geelong were marketed and sold locally, as well as in Melbourne. FIREMAN Established in 1854, the Geelong Volunteer Fire Brigade is represented by this figure reflecting the burning of the “Lightning” in 1869. YACHT CLUB LADY Geelong’s Yacht Club was formed in 1859. 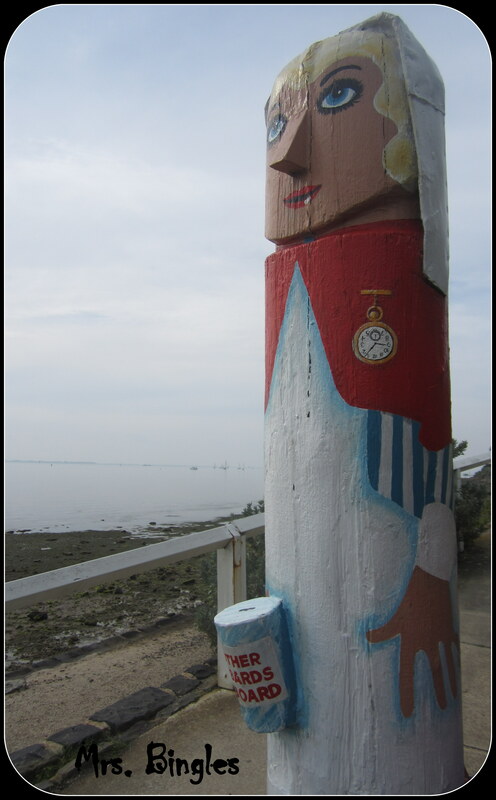 The lady is holding the trophy won by “The Paddy” after racing in the first Geelong Regatta. EARLY GEELONG FOOTBALLER A nearby field, which became Transvaal Square, was used for football practice. 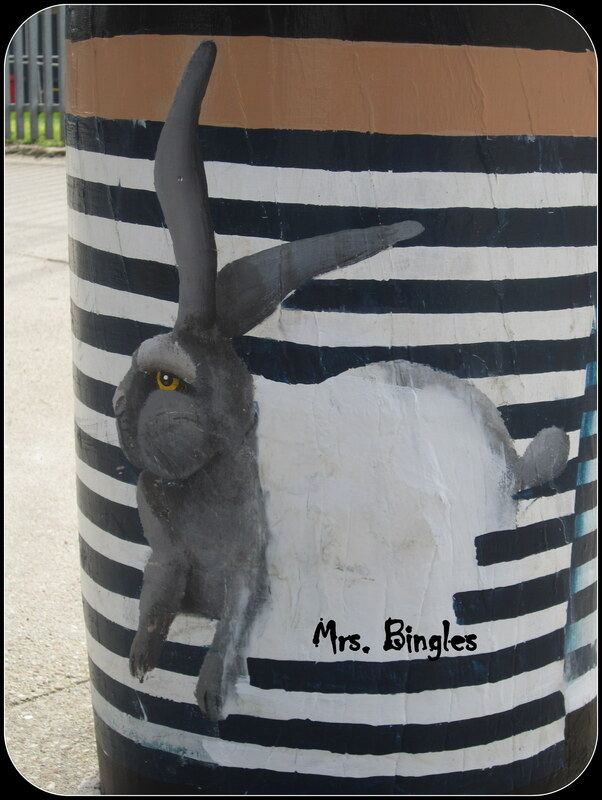 Rabbit My girls noticed rabbits painted on numerous bollards. Why??? Let’s find out! 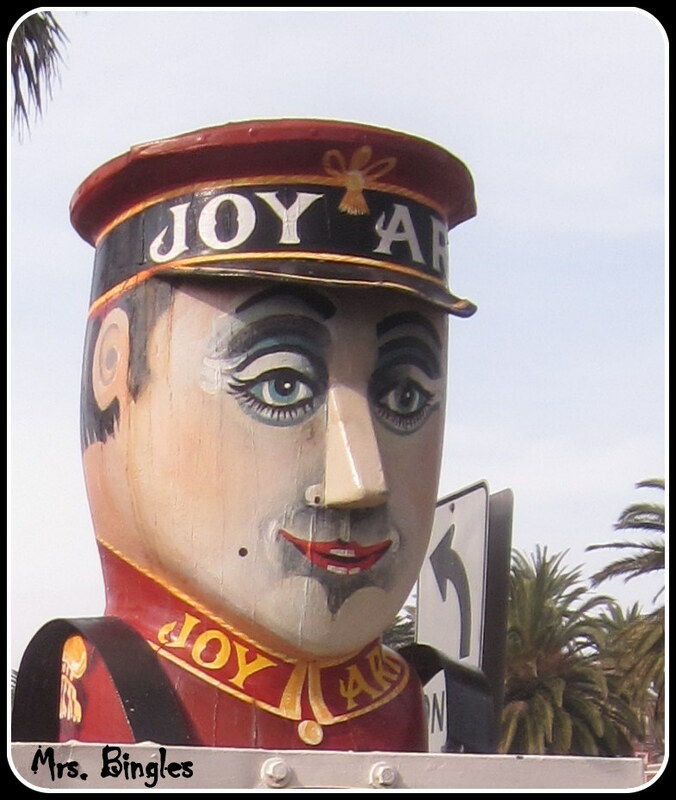 PIERROT The Joy Ark became a hall popular for dance and roller skating in 1914 with fancy dress often featured. JOY ARK SANDWICH BOARD MAN This gentleman advertises the Joy Ark which was built in 1912 as a silent picture movie hall and entertainment venue. TOWN BATHS SWIMMERS CLUB (5) A progression of lifesavers displaying the changing styles of men’s swimming trunks. BATHING BEAUTIES (4) The beach front was the venue for beauty competitions from the 1930’s. 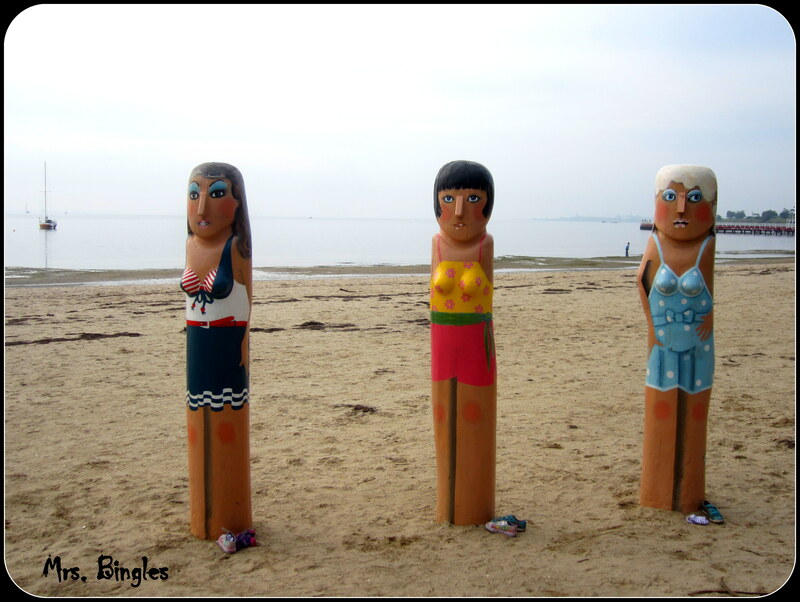 EASTERN BEACH LIFE SAVERS (5) Within this group there is a portrait of Billy Coyte who taught many generations of Geelong’s children to swim. NURSE In 1932 during the Depression, the Mother Hubbard Relief Fund was set up. The Geelong Hospital was founded in 1852 near this site. KOORI FAMILY (3) A family illustrating the local hunter gatherer culture. So, what about the rabbits? 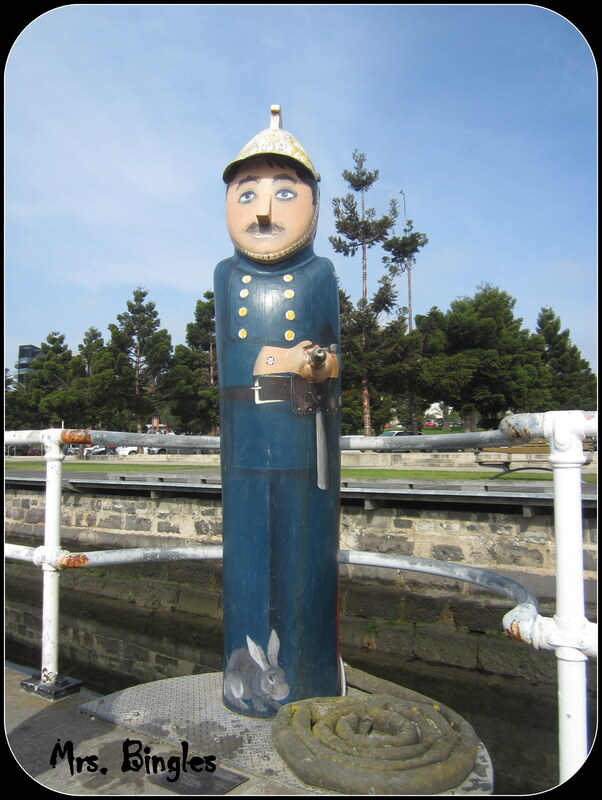 We kept on looking on all the bollards and after a little while it became a game: have you spotted the rabbit? which colour is it? I found out that the rabbits are simply a symbol of the wild rabbits introduced by the English to Australia apparently by Thomas Austin who arrived in Corio Bay in 1859 with the first pairs of rabbits for his hunting pleasure, and they bred like rabbits. Because there is no natural predator of the rabbit in Australia their population exploded. So some bright spark introduced the fox. Guess what? 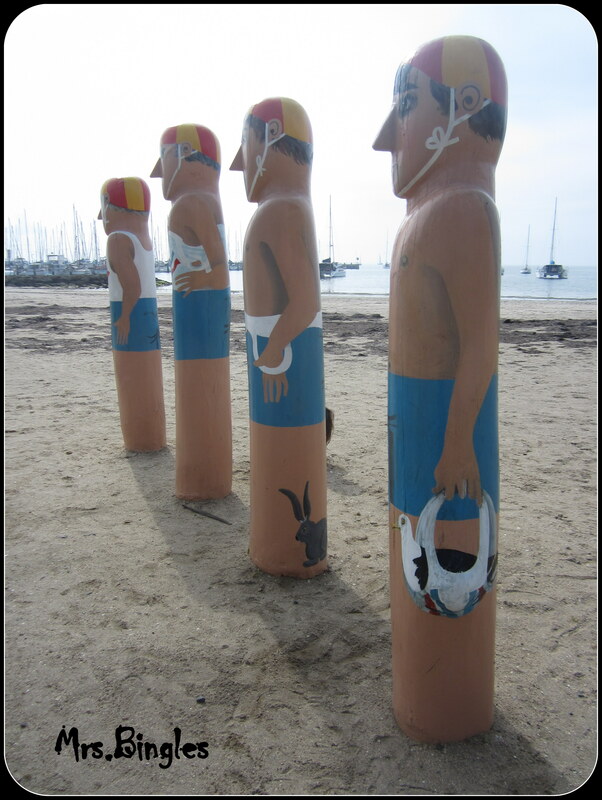 No natural predator for the fox either (source: http://www.onlygeelong.com.au/46369/geelong-bollards-trail). What a great thing they’ve done there! I’ll be asking my friends in Melbourne if they’ve seen these. It’s really a special work of art, beautifully done!